Central Pennsylvania Youth Ballet alumni Lauren Ostrander and J.Q. 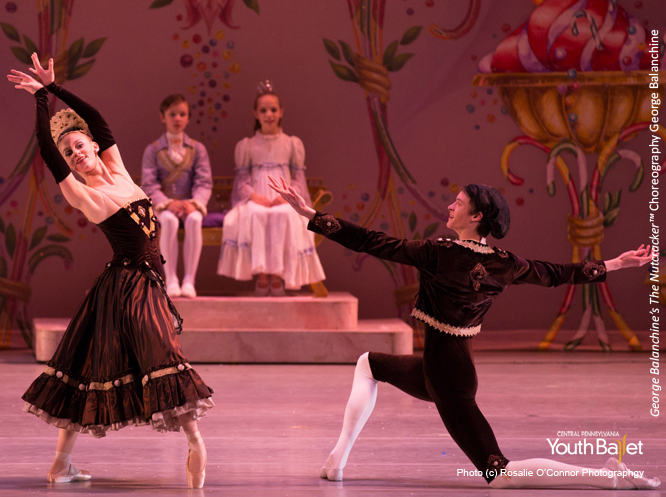 Powers performing in CPYB’s 2012 production of George Balanchine’s The Nutcracker™. Lauren Ostrander – a wildly spirited Central Pennsylvania Youth Ballet alumna. Also a budding ballerina fortunate enough to have her dream come true in securing a contract in a professional ballet company. Although that is what 2014 seemed to have in store for her, 2015 came along and altered her path. Injured and now recovering post-op, Lauren enthusiastically accepted my invitation to write a bit about her story for A New Page Blog. Take a moment to hear and experience Lauren’s heart. Her attitude? Well, let’s just say that positive is an understatement. 2014 saw my dream come true. I landed a job in the second company of one of the country’s most respected dance companies. I had been extremely healthy and, historically, never taking more than three days off for an injury. An avid yogurt fan, I take vitamins religiously. So, calcium was not an issue. I can’t say for sure what caused it, other than dancing. And, I can’t say why I did not feel pain until it was too late. But what I do know is that after a number of weeks in an orthopedic boot a stress fracture at the base of my second metatarsal was not healing properly. No dancer imagines getting injured in the second month of their first job! Those kinds of thoughts are forbidden; and so long as you don’t entertain things as such, you will be fine … right? I wish it worked that way. It was in ‘The Nutcracker.’ Flowers to be specific. I was so excited because, being from CPYB, I already knew the Balanchine choreography. Making it all the more perfect was being cast in the same spot I had danced for three years prior. Here I was, the first day of rehearsal, more than ready to show the company what I could do! Until the last 15 minutes of rehearsal, I was having a blast dancing the steps I had danced dozens of times before as a student. I landed from a jump and it felt as if my foot split in half. I felt a rush of 20 different emotions pour through my nervous system. The strongest was denial. A huge internal conflict began: Do I stop? Do I give into the fact that my foot feels like it is in two pieces? Or, do I fight like I have fought every ache and pain up until this point? I am tough. I can get through this. It is probably nothing. When I was unable to stand on my foot without extreme pain, my brain overthrew my stubbornness. I knew something was wrong! After being off for the prescribed amount of time and still showing very little signs of healing, my doctors began to question the condition of my injury. Multiple opinions and a CT scan later, I learned that my stress fracture had healed into what is called a “sclerotic union.” This meant the healing was not and would not be complete, and I would not be able to dance without surgery. The decision was simple. Surgery was a no brainer as I was obviously going to dance again. I was petrified, but I knew that I could get through it. Central Pennsylvania Youth Ballet alumna Lauren Ostrander rehearsing CPYB’s production of Hineline’s The Sleeping Beauty. Ballet is a short career and injuries happen … that is not a secret. Behind every great dancer is both a respectable work ethic in the studio and also the ability to keep a positive mindset through the ups and downs. I am told that I am presently in for five months of rehab and healing time. That will be anything but easy. Frankly, I know it will take even longer than that to get back to the level I was before I got injured. But I also know that I will not stop until I get there. A quote by Confucius really resonated with me a few weeks ago, “It does not matter how slowly you go as long as you don’t stop.” I am learning that I cannot wait until the moment that I am fully rehabbed to view myself as successful. I have to rejoice in the small victories along the way — being able to walk again, starting physical therapy, and all the other major steps towards getting back on stage. I am also learning that this is time I will not get back. So I am making an effort to explore outside areas and accomplish things that I would not normally have the opportunity for. As I start rehab, I realize each day will bring me closer to dancing under those stage lights again. And when I am there, each bead of sweat, each trial and tribulation, and every hour of class will have all been worth it. At times I have doubts, as everyone does. But from this injury I expect to become less fearful of what I can and cannot accomplish and more fearless as I know I have the power to do whatever I set my mind to. Writer’s Note: Admittedly, writing about an injury can be an important part of the therapeutic process. I hope Lauren’s story inspires you or someone you know who is facing, or will face, a dancer’s injury. Just between me and you, an injured dancer really appreciates encouraging comments. Feel free to pass along your thoughts here. Lauren, thank you for sharing your story. I hope this has been a positive time for you and that your injury has healed properly. Here is to a happy and healthy future! !